"A pep talk for wilted saladmakers." "A pep talk for wilted saladmakers" was what Mollie Katzen hand wrote into her Enchanted Broccoli Forest cookbook all those years ago. 12 years after she wrote it, I picked up a copy at a local bookstore, I was barely 18 and a burgeoning vegetarian. I cooked through both of her handwritten books for years, and still pick them up when in need of inspiration. Or in need of a pep talk for my wilted saladmaking. To me, salads (like sandwiches) are always best when someone else makes them for you. The love that goes into something so simple, or just really good ingredients that have been treated nicely so that they reciprocate: that can't be faked. And I swear that if a friend or restaurant makes me a salad it's better by far than one coming from my own hands. I likely ate a record number of vegetables in 2014. I ate them steamed and raw, roasted, braised, and fried. But very seldom do I make a proper "salad". I know this is true when last week I had a lot of leftover salad greens and made a salad for supper and my husband said, "Wow. A salad." (And he ate every biteful I loaded onto his plate.) And the reason I had made the salad in the first place was that when I had friends visiting, E told me she's been favoring a honey mustard vinaigrette - so I made one up for lunch that we compiled of greens and roasted veggies, some cheese and chopped prosciutto. Man that salad was good. Probably because I only helped with the salad, and I was surrounded by good company. I had extra vinaigrette, and we ate it and then I made more for Christmas Day. It was good a vinaigrette. I will write it down in a minute. In November, I met my friend Deena in Chicago at we ate at Little Goat Diner. I had been to the diner once before, and couldn't wait to go back. We shared a salad called the Chickpea, which when read looks like a plain old salad. I mean, you expect when reading the ingredients of a salad to just get a bowl of vegetables and then dutifully eat them... even when you also know that eating a "salad" in a good environment, made by talented people and enhanced by the company of a good friend is going to blow you away. That salad came out in a gigantic bowl in front of us and I am still thinking of it to this day. In December, I ate a salad at a newer local restaurant with one of my best friends. We didn't know how much food to order and at the last second added on a salad to our order. Again, I didn't expect to have a plate of salad overtake me for weeks after. The ingredients were: Shaved Brussel Sprouts | Honeycrisp Apple | Pecans | Balsamic Shallots | Blue Cheese Croutons | Roasted Garlic Dressing. More garlic than I've eaten in one place at one time in just about forever and it was definitely the plate we licked the cleanest. If I frizzled up a bunch of shallots, broke out my mandoline for brussel sprout shaving, and used my own bread for croutons I couldn't mimic that salad I don't believe. If anyone did, I needed a pep talk for wilted saladmakers. Maybe the dining events of the past 2 months have challenged me to want to make a really good salad, one that could stand on its own and be eaten a number of ways. (It could also be that I am so sick of sweets that I can hardly wait for the calendar to change tomorrow and I can impose self-induced sugar-freedom.) This salad is one I am happy with. I thought all morning about eating it for lunch today (the baby liked it too - the chickpea part anyway... he can actually say "chickpea", which is all the more endearing), after eating a different version last night. It's the kind of thing that gets better with age. Keep the components in separate containers and have instant breakfast, lunch, or dinner with very little fuss. 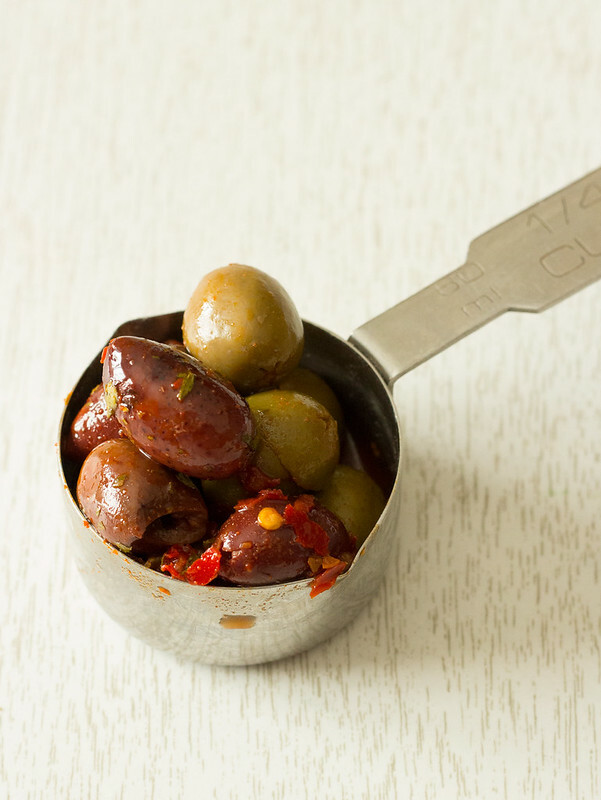 Chile olives are among my most treasured things. My co-op used to carry them, and they haven't now for several months. I was overjoyed to find them at Whole Foods, even if sometimes it means making a trip there just to get the blasted olives. I'm sure you could substitute other brined olives and some chile flakes of your choosing. 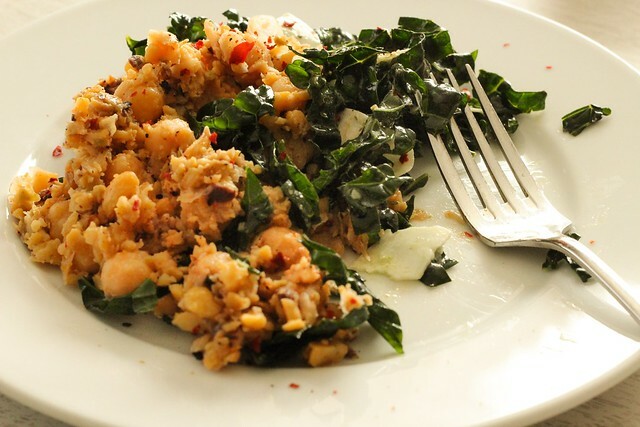 The dressing for the chickpeas is versatile and can be used in other things. It keeps as well as all homemade dressings do when stashed in the fridge, for a week or so. Last night I ate this salad with buttered sourdough toast and topped with runny-yolked fried eggs for supper, and today I ate it just plain for lunch. I'd imagine it would be good in a number of different ways as well, including being wrapped up in a tortilla or another piece of lettuce of some sort. I'm a big fan of the kale salad Dr. Weil popularized; even though kale's superstardom is waning just slightly, massaged kale salad is still good and makes an awesome pizza topping and omelet filling. I especially love that it gets better with age, 4 days in the fridge and it's just as good as the first day, probably even better. 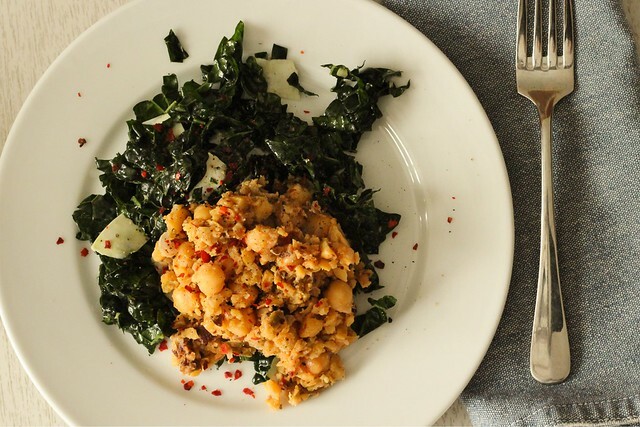 I swear that I love chickpeas more after I learned how to perfectly cook them, and I have Alton Brown to thank for that. I alter my method to include brining the garbanzos overnight, and then I often just cook them on the stovetop instead of dragging out my slow cooker. When cooked with a tiny amount of baking soda, they always end up with creamy centers. makes about 4 good servings. Remove the stems from the kale and slice thinly. Mash the garlic cloves with salt on a cutting board with a chef's knife to make a paste. Then blend the paste with the lemon juice and olive oil to make a dressing. Add extra salt if you think it needs it, then combine with the sliced kale and massage it for 5 minutes. I know, it seems silly to be standing around with your hands in a bowl of greens, but it does seriously do something magical to them. Add cheese if using and that's it. Will 2015 be the year of the salad for me? I kind of think so. I'm anxious to turn the page on the heavy and well sugared foods of late December and say good morning to a lighter, brighter, more vegetable infused diet in January. If you have good salads to share, please send them my way!